Millions of warm hearted, fair minded humans live in America, though few are part of the military. If they were, perhaps the carnage could be kept under control. To Americans with a conscience I say – get a grip on what’s going on in Afghanistan and Pakistan, reign in the White House. To Australians – pull your head out of the keg, ignore the heartwarming hype about “building infrastructure” - we’re part of a pitiless war machine. It started as a revenge for 9/11, easy as shooting quails in a barrel. “Kill the bastards” screamed Murdoch’s pet Aussie ranter in the New York Post, “a gunshot between the eyes … blow their countries into basketball courts”. And we did. In Afghanistan, the US bombed anything that wasn’t a US franchise, which was…everything: wedding parties, funerals, family compounds, villages, the Al Jazeera office. Back in January 2002, Marc Herold told ABC radio that a “realistic’ estimate of civilian deaths since the invasion was 5000. Every year since, the slaughter continued. In 2008, according to the New York Times, American led coalition forces killed 828 civilians, mostly “in airstrikes and raids on villages, which are often conducted at night”. A few days ago, these same gutless idiots operating in the Western province of Farah, allegedly killed over 100 civilians and are trying to blame it on the Taliban. “No that’s not true” said an MP from the area, Mujammad Naeem Farahi, “and I am someone who supports the American presence”. US Defence Secretary Robert Gates promises to “make amends”. Look at the images. This isn’t flushing out militants. It’s a killing field. And the murders continue in Pakistan, often hatched and executed from Creech Air Force base in Nevada, where the silent drones glide into the skies every few minutes armed to the teeth. So far, the “success rate” of drone assassins is abysmal. Two percent of the targeted “bad guys” are killed, and the rest of the dead - 98 percent - are innocent civilians. Today families in Swat are caught in the crossfire. Imran Khan has asked, “what country bombs its own people?” A country caught between a weak leader and an hysterical overlord. The US enforced battle “started without warning and their shells smashed our houses and wounded so many people," a fleeing resident told the UK Telegraph,"it was needless. The Taliban had already gone." Mohammed Aurangzeb, a former ruler of Swat says: "Far more people have been killed by the army than by the Taliban during military operations." Kathy Kelly, a co-coordinator of Voices for Creative Nonviolence, asks: “Can we see a pattern in the way that the U.S. government sells or markets yet another war strategy in an area of the world where the U.S. wants to dominate other people’s precious resources and control or develop transportation routes?” You bet we can. And so Prime Minister Rudd, Defence Chief, Angus Houston and the mainstream media, will you continue to lecture us on the “noble cause” in AfPak? Will you conjure Tobruk, summon up the ANZACS, defend the valor of drone assassinations? Will you dare to cast a glance at the butchered children. 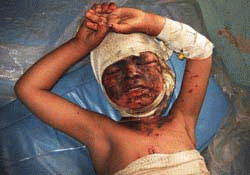 No, not the sanitised images in our nursery-maid media, but the true life horrors – corpses of kids by the truckload. Will the pilots get punished? They’ll get medals. The bereaved might get a fistful of dollars. The odious Taliban will get new recruits. Aussie soldiers have unwittingly killed their share of innocents. Now our Special Operations Task Group is reportedly carrying out hunt & kill missions that are proudly linked to the Vietnam-era Phoenix Program. This was a lawless torture and execution squad that targeted civilians and is remembered as "the most indiscriminate and massive program of political murder since the Nazi death camps of world war two." From 1968 to Aug 72, about 26,369 South Viietnamese civilians were slaughted. All for what? In the past month, 438 bombs have been dropped on Afghanistan, and the tally keeps rising. Hillary Clinton expresses “sincere regret” at the 100 plus deaths, while Obama turns up the heat. This is a war of shame and sadness, a war that reveals what hollow humans we have become, a war that reflects the insatiable appetite of the West for conquest, killing and self delusion. Yet we still think we are the good guys.